Sometimes it seems like we have all the time in the world. Other times, we need to focus more on time management. Especially if you have a lot of work coming up, managing your time is necessary for staying on track and getting stuff done. Just like everyone else, I have fallen pray to procrastination, but I am able to overcome it. I can get myself back on track fairly easily, and I am going to share how I do that in this post. Time management seems daunting at first, but it is not that hard after you find what works. The tips I share in this post might not work for you. So, after reading this post, look for other ways that you can manage your time. You can find tons of ideas online or even come up with your own ideas. With any change you make, experimentation is important. You have to figure out what works best for you and your life. Be willing to change up how you mange your time, too. What works one week may not work the next. Figure out what you want out of your day or week and then decide what you need to do to manage your time. This goes for all of those night owls reading this. If you stayed up late watching videos or practicing your instrument, try and wake up a little early. You don’t have to get up before the crack of dawn. But, the earlier you start your day, the more time you will have. You won’t have to feel rushed to get everything done. If you cannot practice your instrument right away, try and do some other tasks. Clean your room or home. Do some laundry. Listen to upcoming repertoire. There are dozens of things you can do that don’t actually involve playing music. Write down everything that you want to accomplish that day. It can be anything from going grocery shopping to memorizing a section of a piece. Making a list of all your daily tasks puts everything on paper. You can see how much you have to do that day, and then you can prioritize tasks. Writing everything down will help you see the bigger picture. It may be that you have less to do than you thought. If that is the case, take your time with things, and don’t rush. Enjoy living, and enjoy what you are doing. Live in the moment. If you have a lot of stuff to do, decide what matters most. If you have a concert next week, you should probably practice the music for it. When you don’t have any performances coming up, you can focus on other things. Get your household chores out of the way or search for prospective students and gigs. Your priorities will probably change with each day, and that’ okay. Setting your priorities will help you figure out what really needs to be done and what can wait a day or two. If you have time for some low priority tasks, get those in so you don’t have to do them later. Use a planner or calendar. If you want, you can use a planner or calendar to keep track of everything. You can use a paper calendar or a digital one, and you can customize what you use it for. I have found that paper planners don’t work for me. I use them for a day or two, and then they end up in the bottom of my bag, untouched. So, I have switched to a digital calendar. I use Apple’s iCal on my laptop and phone. The calendar is great for events and other deadlines. For to do lists and other tasks that are not scheduled, I use Reminders or Notes to keep track. Figure out what works for you, and create a system to fit your lifestyle. In a lot of cases, your day to day life will be different. You won’t always have the same performance gigs, rehearsals, or private lessons. However, do your best to set a routine. Wake up at the same time. Eat the same breakfast and/or lunch each day. Do something consistently so that when big changes occur, it won’t take such a toll on your body. I try to wake up at the same time each weekday, but I do let myself sleep in on the weekends. My menu for breakfast and lunch is the same, unless I go out for a meal. Keeping a consistent waking and eating schedule allows me to prepare for the rest of the day. Hand off what you can. If you have too much to do in one day, find some help. You can ask a roommate or friend for help or hire someone. While you have to show up to rehearsals and performances, you don’t always need to do everything. If your kitchen is in need of some organizing, see if someone you know could do it. If your website needs updating, hire a virtual assistant or content manager for the day. The money you spend on help will be worth it if it means you aren’t up for a full 24 hours. I try to do what I can, but sometimes, I have other priorities that need my attention. When I can’t do something, there is nothing wrong with asking for help. 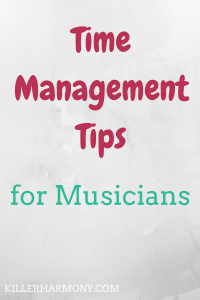 As a musician myself, I know how hard it can be to do everything you need to do. There have been times where I had to let things slip, and I wish that I could have hired someone to do those tasks for me. If you ever need help, please contact me. I would be glad to help another musician out. As musicians, we have a lot of stuff to do. We have to practice, look for gigs, maybe teach or attend lessons. Then there are other, non-music parts of life that we have to attend to. Social media has recently become one of those non-music activities that can really eat up time. 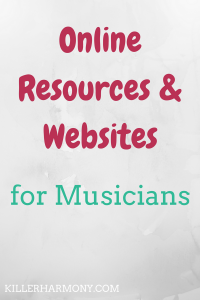 I am not only a musician, but I enjoy creating content, like blog posts and social media posts, for other musicians. 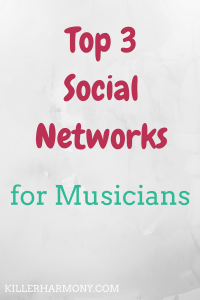 Social media can be difficult to learn and master, but there are a few things that any musician can do to better understand social media and use it to their advantage. 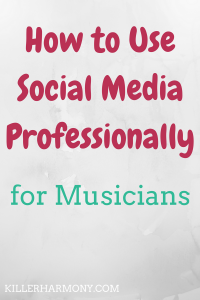 Here are a few tips that I have that will help you get started with using social media for your music. This is simple, but making a few changes to your profile photo, biography, and other information can vastly improve how your profile looks. Whether you use Facebook, Instagram, or Twitter, you should have a professional profile. Upload a photo of yourself with good lighting, maybe even with your instrument. This will look a lot more professional and appealing than a low lit, mirror selfie taken at one in the morning. Update your biography to reflect your musical experience or your current work. Instead of saying something like “I love cheese and wine” try “I play piano, and I love helping others.” This second statement commands more attention and respect, and it shows potential clients or students that you are ready to work. Also, don’t forget to make your profile (at least for Instagram or Twitter) open to the public. Then you can grow your following and market yourself. If you are serious about using social media for your career, create a Facebook page or turn your Instagram or Twitter into a business account. You will be able to use social advertising and provide more information on how people can contact you. With Facebook, it is much easier to have a page where people can follow you instead of using your personal profile. You are not allowed to create a second Facebook account, so creating a page to reach more than your inner circle is best. For Instagram, you can add your email or physical address and even a phone number. You can also look at deeper statistics to learn more about what works and what doesn’t. If you want to use social media in a professional way, you have to keep in mind how your posts will come across to followers. Your public account could be seen by anyone from a prospective client to a parent looking to put their child in music lessons. Your appearance counts. You don’t need to be fake, but you should be professional and genuine when you post. Your public profile is not the place to rant about politics or how your day sucked. Keep in mind the audience you are trying to attract, and post content they want to see. It is not always easy, but posting for your audience will get you farther than posting for yourself. Social media is a great way to connect with others, and video is one more way to do that. Especially with music, video can accomplish a lot more than just text and photos. You can use video to promote an upcoming concert or album release. Videos can be put toward your online portfolio. 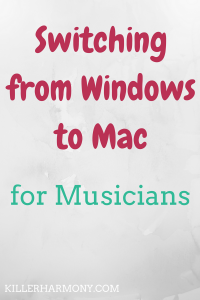 You can establish yourself as a musical expert through video. No matter how much you post about how you loved getting your masters at Julliard, your playing still matters. Someone who has n advanced degree is not automatically better at their instrument. Using video to showcase your skills will set you apart. It took me longer than I like to admit to start posting videos. I was worried about how I would sound or if people would even watch my videos. I worried I wouldn’t sound good without expensive equipment. The truth is, all you need is a smartphone with a good camera, and possibly an external microphone. Just like with your instrument, keeping up with social media takes time and/or money. You have to manage it regularly in order to foster a good community. Social media requires regular maintenance, management, and also regular evaluations of what works. If you do not have the time to dedicate to managing a social media presence, look no further. I am a social media manager and web content manager with a focus on musicians and other creative professionals. I have experience managing my own accounts and writing about how others can do the same. However, I understand that not everyone wants to spend the time to build their social media presence. If that is you, head over to my Web Content Management page to learn more. Have you used social media to promote yourself before? Have you worked with a content manager to grow your accounts? Let me know in the comments!